The "5 Scenes" was composed in 1976. This "duo concertante' could be given a dance dimension by an imaginative choreographer. While the first part is set for vibraphone, three bongos, guiro, two wood blocks, tam-tam, two cow-bells and rattle, the second percussionist plays marimba, small drum, two tom-toms, five temple blocks, cymbals, tambourine and triangle. The first movement opens with a vibraphone solo, joined by the marimba in the third bar. There are twenty bars of keyboard, then drums, cymbals and temple blocks enter together. The constantly changing tempi, rhythms and times of the first "scene" deserve special attention. The works second movement is marked by its gentle flow from one instrument to another. Despite its brevity it displays a thematic development. The third "scene" - set for wood blocks, guiro, bongos, temple blocks and tom-toms - is a little quieter than its predecessor. Interesting contrapuntal lines determine the movement's structure. The fourth movement, even more restrained in tempo, begins like the opening movement with an interplay between marimba and vibraphone. The constant alternation between 3/4 and 4/4 time is critical. Gong and cymbals command attention with their distinctive notes. In the fifth "scene", opened with the rattle, all instruments are presented once again, and their strident contrasts convey something of the bustle of a fair. 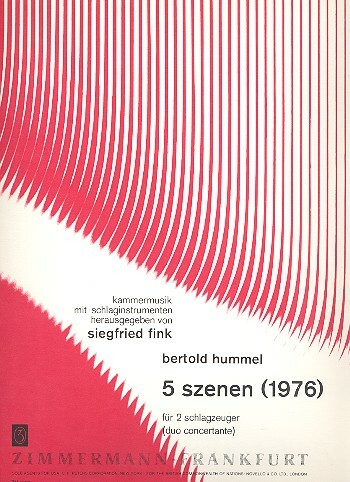 5 Szenen (1976) für 2 Schlagzeuger by Bertold Hummel is composed for two percussionists. One player will perform with vibraphone, 3 bongos, guiro, 2 woodblocks, gong, 2 cowbells and ratchet. The second player will perform with marimba, snare drum, 2 tom-toms, 5 temple blocks, 5 suspended cymbals, sizzle cymbal, tambourine and triangle. Mallets and sticks to be used are indicated throughout the work. The first movement opens with solo vibraphone for two measures. The marimba then makes its entrance. After keyboards are featured for twenty measures, the drums, cymbals, and temple blocks make their appearance. Pedaling is well marked for the vibraphone as are all dynamic and instrument changes. Throughout this movement are constantly changing meters and accidentals which must be closely observed. Tempo changes are also found at several places in this movement and must be followed. The second movement has a tempo of eighth note = 88. It will take diligent practice to ensure a smooth flow from one instrument to another and still maintain musical sensitivity. This is a short movement but it will take time to develop. The third movement is a bit slower, quarter note = 128. It features the guiro, woodblock, bongos, temple blocks, and tom-toms. Very interesting contrapuntal lines are developed throughout this movement. The fourth movement, slower than the third with a tempo of quarter note = 60, once again opens with a marimba and vibraphone duet. The meter is constantly changing from 3/4 to 4/4 in this movement. The gong and sizzle cymbal are also employed and the way they are to be struck is well marked. Pedaling and dynamics are well marked and accidentals must be watched throughout. changes to be observed in this movement. Throughout this work the performers will be challenged technically as well as musically. This selection is good program material. It is not a work for young players. The performers must have mature facility on the melodic instruments as well as the rhythm instruments. This work should be musically rewarding both for the listener and performer.